As the most western city in Broward County, Weston Florida is not immune to the dry winter weather and hot, muggy summers. While living in Florida has the benefits of beautiful sunshine and warm weather, we still get the occasional rains and summer storms coming through. Thankfully we have roofs over our head to protect us and keep us comfortable all year round. But what happens when our roofs fail? Mayhem! Or at least it feels like it. That is when Universal Roofing comes to the rescue. Since 1980, we’ve helped thousands of families and business owners get the quality roofing services they deserve, whether they’ve incurred damages from one of those random storms, or if their roof is just ready to be replaced. Whatever you need, Universal Roofing is a full service, local roofing company right down the street, offering a 100% satisfaction guarantee on all residential and commercial jobs. For over 30 years, Universal Roofing has made it our goal to provide the residents of Weston, Florida with the best roofing services that is most importantly, affordable and dependable. Especially when your roof has been unexpectedly damaged by a storm, mold, or fallen tree, we make sure to take the stress of your back by offering 24/7 emergency roofing repairs for residential and commercial buildings, no matter the time of day or the time of year. Our licensed and insured roofing contractors are always on standby, ready to jump in our state-of-the-art trucks and drive out to your home or business to inspect, and often repair your roof right on the spot. So give us a call at 954-923-5100 when you need a fast and reliable roof repair. At Universal Roofing, we hire only the most skilled, and knowledgeable roofing contractors. With ongoing training throughout the entire year, our experts stay up-to-date on the newest and best solutions for you roofing problems. That means, when you’re ready to install a new roof and you want to know ALL of your options, Universal Roofing is here to help. We know the ins and outs of every type of roofing material, and we’ve worked on all different sizes and shapes of roofs so that we know exactly what kind of roof will last you the longest, saving you more money in the long run. When you give us a call, we will offer you a FREE quote on your new roof. What is more, we aren’t afraid to get creative when it comes to designing and installing your new roof. Since no two buildings and homes are alike, no two roofs are alike either! That means your unique roof deserves special attention and sometimes even a special design. Don’t worry, we promise to always stay within your budget and that’s where our creativity really comes into play. So don’t delay! Give us a call and let’s start working together to get that beautiful new roof designed and installed in no time. With successful projects across all of Broward County, and with every type of roofing material imaginable, it’s no wonder Universal Roofing is among the highest rated roofing businesses in Florida. Our roofing materials are selected for quality, endurance and style, and our installation and repair services are always done with the highest quality of workmanship. So whether you need a checkup, or a full blown repair, you know that we will handle your roof with care every time. If your home lies within the Weston, Florida area, then sign up for a free roofing estimate and get your roof checked for cracks, thermal shock, or any number of problems that arise after a dry winter. 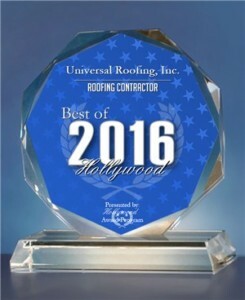 Roofing in Broward County is a big business, and Universal Roofing has done business with the biggest clients! Homeowners and business owners alike, we treat everyone with same amount of respect and no project is too big or too small for our highly skilled professionals. So if you want your roofing done right the first time, give us a call at 954-923-5100 and we promise to take care of all your worries while putting money back into your pocket.